Tottenham superstar Christian Eriksen is certainly still in the festive mood after being gifted a goal against Bournemouth earlier today. Eriksen struck a left-footed shot from outside of the box early on in the game, Eriksen’s shot took a huge deflection before hitting the back of the net. Surprisingly the Dane was awarded the goal despite the deflection. 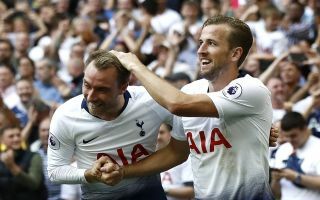 Tottenham demolished Bournemouth 5-0 this afternoon and Eriksen was in such a good mood that he took to Instagram to mock his teammate Harry Kane after a fiasco last season which saw the England captain take action to claim a goal that should of have been Eriksen’s. Kane professed that his touch on the ball led to it hitting the back of the net meaning the Dane was without a goal just because Kane wanted to edge beat Mohamed Salah to the Premier League golden boot. Kane’s bizarre tactics to boost his goal tally didn’t work and Salah won the golden boot with a record-breaking tally. After Manchester City’s shock defeat to Leicester earlier today, Tottenham have moved into second place in the league. Could Mauricio Pochettino’s men be the ones to stop Liverpool from lifting the Premier League title?